The Twin Cities have given rise over the years to a rich cultural scene of creativity and innovation. SNAG is pleased to feature several exhibitions in Minneapolis. Learn more about this and other exhibitions happening around the world. 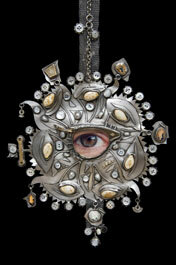 Kristin Diener’s “Eyeball Pendant” is featured on the cover of the book On Body and Soul: Contemporary Armor to Amulets by Suzanne Ramljak. The exhibition Protective Ornament, in conjunction with the book, opens in May at The Metal Museum in Memphis, TN. 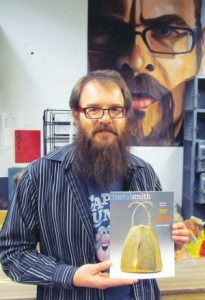 John Dodds, an Alamosa, CO artist and high school art teacher, was recently acclaimed in Metalsmith for his anti-trophy artwork. An article related to this was published in the Valley Courier newspaper in Alamosa. Kaminer Haislip is receiving the Samuel Gaillard Stoney Conservation Craftsmanship Award on Historic Charleston Foundation Charter Day. 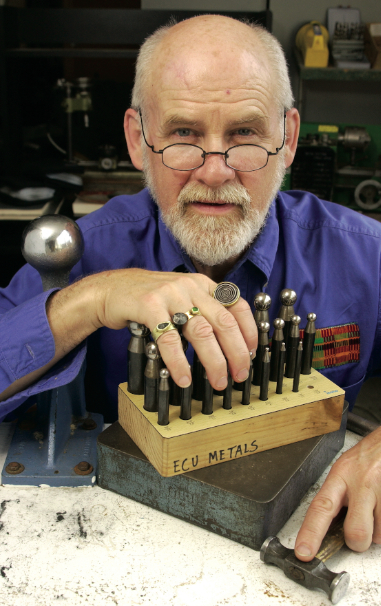 Haislip is a contemporary silversmith located in downtown Charleston, SC. In the past week, Road 2 Success SPOT ON has wrapped up our first focused discussion on making a living as a creative entrepreneur, and we’ve jumped right in to our new discussion on web presence and social media. April’s panel of experts is Gillian Batcher, Shannon Conrad, Victoria Lansford, Heidi Lowe, and Amy Tavern. With just a little patience and a lot of pressure it is possible to get incredible results embossing etched imagery and text onto chamois leather for use in any project. Begin by selecting a sealed etched plate whose imagery or text you would like to have embossed onto a sheet of chamois leather.